How Do I Know It’s an Emergency? Gather yourself and take a deep breath. You should carefully assess the situation. Contact your emergency dentist to explain what has happened. If you lose a temporary crown, your tooth is left vulnerable to food particles and bacteria, so it’s important to retrieve the restoration and dry it off. Next, you can place a dollop of toothpaste, denture adhesive or dental wax on the fixture to temporarily hold it in its designated place. Place it back in your mouth. If that’s not possible, then soak the tooth in a cup of milk. If your lip, cheek, tongue or other soft tissues are bitten or cut, you should clean the wound and then apply a cold compress to reduce any inflammation. If bleeding persists for more than an hour, then you should head to your local emergency room. The first step for addressing a broken tooth is to rinse the area with warm water. 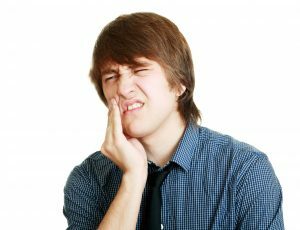 Next, carefully bite down on a cotton gauze placed over the tooth and apply a cold compress to reduce any swelling. For a toothache, first rinse your mouth and then carefully brush and floss to remove anything that could possibly be irritating your tooth. To address the pain, you can take ibuprofen and apply a cold compress to the outside of your jaw. When you have something stuck between your teeth, you should first gently floss to attempt to remove it. If you are unsuccessful, then immediately reach out to your emergency dentist. In a perfect world, there would be no dental emergencies, but the reality is that mishaps happen. What matters most is how you respond to any developing issues. With the help of your local dentist, you’ll be able to recover from a dental emergency and get back to enjoying the rest of football season in Harker Heights! Dr. Melinda Duncan is a graduate of The University of Tennessee Health Science Center. Throughout her career, she’s remained steadfast in her efforts to provide her patients with the utmost in dental care, which is why she takes continuing education yearly. Dr. Duncan provides comprehensive care, which includes emergency dentistry, at Market Heights Family Dental, and she can be reached for more information through her website.